This lens was designed specifically for color imaging. Its low chromatic aberration delivers accurate color information for 3-chip cameras. 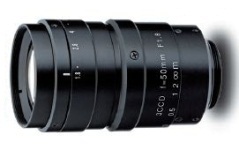 This lens's megapixel resolution and low distortion preserve image detail. Resolution is 120 lp/mm at center, and 100 lp/mm at the corners.